"In gardening, you cannot cram. You cannot wait until the last minute to plant and expect a harvest the next day. Shortcuts do not work in a natural world, just as they do not work in our spiritual world. You cannot cram and suddenly become a person of integrity, courage or compassion. In relationships, caring, sharing, tenderness, and consideration can never grow and flourish when too little time is spent nurturing the seeds of shared vision, trust, and compassion." For me, all I really needed to know I learned in the garden. Tending a garden from clearing to planting to harvesting has been my way of cultivating the soul. My hands and heart have dwelt in some patch of dirt every year of my life. Nature's gifts -- dirt, seeds, sun, and rain -- combine to sustain life. I grew up on a 140-acre farm in rural Vermont, a sort of Noah's ark with pairs of goats, sheep, cows, ducks, pigs, horses, and a two-acre vegetable garden. Providence and the work of our hands provided all that we ate. Gardens are nature's classroom: encouraging imagination; instilling a love of life; teaching the value of work and its rewards. One of my favorite definitions of God comes from a child in a Sunday school class who said, "God is what knows how to grow." Gardening makes real and vivid what we know to be true: we constitute, with all growing things, a single community of life. The universe is often uncertain but ultimately beneficent. As I grew older I took more responsibility. So too with my spiritual growth and development. First wise elders guided my path. Later I became the hopeful gardener of my own soul, feeding and weeding my own inner spirit. In our gardens we learn the deepest of spiritual lessons. By participating in the direct preparation of our own food in collaboration with nature, we understand our true link to the land upon which our survival depends. "For everything there is a season and a time for every matter under heaven: a time to be born, and a time to die; a time to plant and a time to pluck up what is planted" (Ecclesiastes 3:1-2 NRSV). 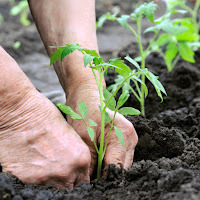 The hand of God connects spring and fall, seed and harvest with all the seasons of our souls. We change and grow with each season. The god of the garden is a god for all seasons. The god of the garden is what knows how to grow. "a time to kill, and a time to heal;...a time to love, and a time to hate; a time for war, and a time for peace" (Eccl 3:3, 8). I am not proud of my competitive and murderous aspects. I do not always like what looks back at me from the mirror of my soul, but self-reflection is part of the process of cultivating the garden of the soul. The god of the garden sees all and blesses all without judgment. I have never met a gardener the world over who was not generous. On a trip to Tanzania, I met a gardener who gave me some brightly variegated tan and purple flower seeds. He thought seeds from his garden at the base of snow-capped Mt. Kilimanjaro would flourish in a garden two continents away, nestled at the base of glacier-covered Mt. Baker. So I planted his passion flower seeds along with seeds I purchased from Burpee Seed Company and reflected on the contrast between Burpee's patented high-priced seeds and the gift from the African gardener. Who gave Burpee their first seeds? Gardening cultivates generosity and gratitude for the gifts freely given. The god of the garden knows no private ownership, no power over, no permission to oppress. The god of the garden knows no east or west, no north or south. The god of the garden blesses the generous giver. In gardening, as in all of life, shortcuts and impatience do not work. As a college student, I crammed for my English literature exams. As a result, all I remember about War and Peace is that it is about Russia. In gardening, you cannot cram. You cannot wait until the last minute to plant and expect a harvest the next day. Shortcuts do not work in a natural world, just as they do not work in our spiritual world. You cannot cram and suddenly become a person of integrity, courage or compassion. In relationships, caring, sharing, tenderness, and consideration can never grow and flourish when too little time is spent nurturing the seeds of shared vision, trust, and compassion. There are no shortcuts and no way to fake the harvest. One quick application of instant "Miracle-Gro" for the soul will not do. The god of the garden blesses the patient sower and reaper. A garden is one place in the universe in which you can see and even touch a miracle. My compost heap is teeming with tiny, squirming, food processing plants whose work no human technology can duplicate. Dead and dying kitchen waste becomes reborn through lowly earthworms, whose life work is transforming garbage into black gold. These creatures work day and night and teach us that miracles do not just happen all at once, but often come after a lot of hard work. The god of the garden transforms the dead into the living. Our gardens draw us into that profound, unspeakable knowledge that we are inseparable from the land we live on, connected in the web of past, present, and future generations. Corn seeds pass from one generation to another, assuring a world without end. Each one of us who supports nature's efforts is a co-creator of life. Each one of us who becomes a hopeful gardener of the soul is a co-creator of a faith that we can and will sustain ourselves. "Even if I knew certainly the world would end tomorrow, I would plant an apple tree today," the sixteenth-century theologian Martin Luther once said. Luther understood the true meaning of the paradox of faith: Faith is belief in the unbelievable, but believing in it anyway. The god of the garden cultivates eternal hope and faith. Begin with a personal assessment of your earthly surroundings and outdoor space around you. Ask yourself, how does my plot or pot of earth reflect my character and my spiritual life? What would I like to change in the garden of my soul? What lessons might I learn from tending a garden? Then, begin your own garden. Help others learn gardening skills. Plant more than you need, and give the rest away. Donate land to someone without a garden plot. Gardening is active participation in the deepest mysteries of the universe: death, rebirth, and the single community of life. The god of my garden blesses every gardener of the soul. Rev. Barbara Davenport, now retired, previously served the Skagit Unitarian Universalist Fellowship (Mt. Vernon, WA), South Fraser Unitarian Congregation (Surrey, BC), and was a campus minister at Western Washington University in Bellingham.